Professor Lynne Huffer traveled to Sweden, discussing philosopher Michel Foucault in the same country where he wrote "History of Madness," which inspired her "Mad for Foucault." 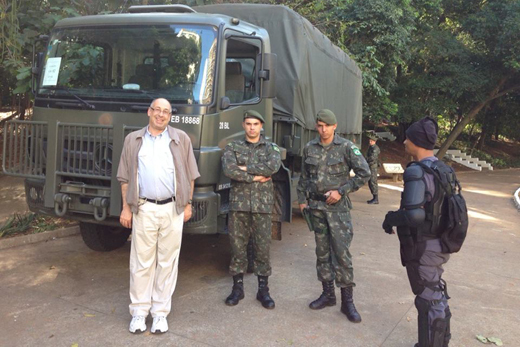 While in Brazil during the World Cup, history professor Jeffrey Lesser posed with members of the Brazilian Army protecting the U.S. soccer team. 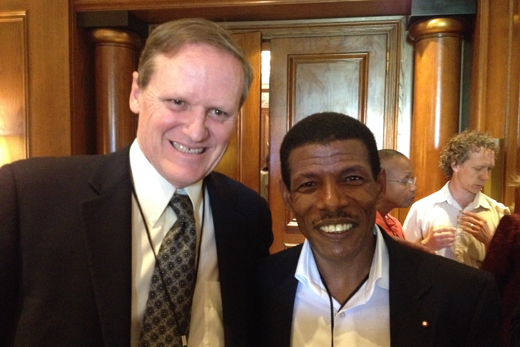 During a conference in Ethiopia, anthropology professor Peter Little appeared in a plenary session with Olympic gold medalist Haile Gebreselassie. 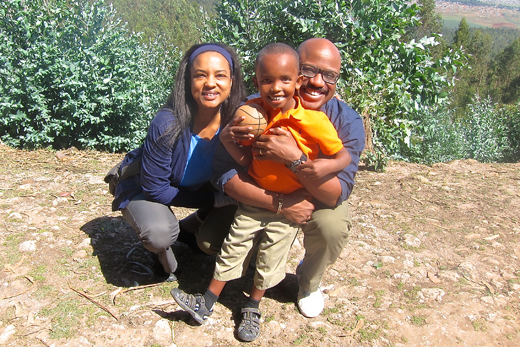 Political science professor Michael Leo Owens and his wife, Karen, traveled to Addis Ababa, Ethiopia, to adopt their son, Tadesse. 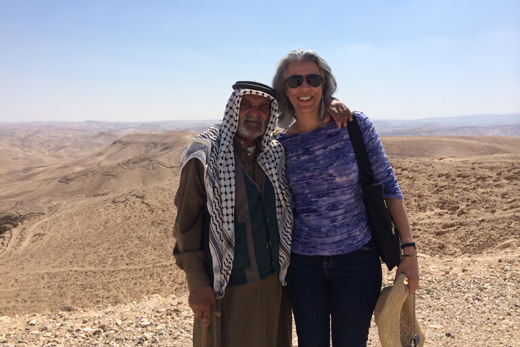 Sita Ranchod-Nilsson, director of Emory's Institute for Developing Nations, traveled to the West Bank. Here, she poses with the grandfather of a family developing guesthouse facilities at a community-based tourist project. For many Emory faculty and staff, summer isn’t a trip to the beach — unless they are there to conduct research or engage in a learning experience. Pamela Scully, director of the Emory Center for Faculty Development and Excellence, sums up the benefits of these experiences including "new friendships begun with Emory colleagues and students, as well as other professionals." "I have come back energized about my own research on sexual violence and post-conflict peace building and have already started thinking more about how ethics informs my teaching and my work," Scully says of her summer travels, noting how her experience "reaffirmed my belief in the importance of the humanities in helping our students become truly educated citizens of the world." With the new academic year well underway and fall having officially arrived, here is a look back at the diverse summer travels of several Emory faculty members. Lynne Huffer, Samuel Candler Dobbs Professor of Women’s, Gender, and Sexuality Studies, traveled to Malmö, Sweden, to give a paper at the Foucault Circle conference. Michel Foucault was a French philosopher and historian (1926-1984) who wrote about madness, the prison system, sexuality and historically shifting regimes of power-knowledge. Conference participants included Foucault experts from around the world. 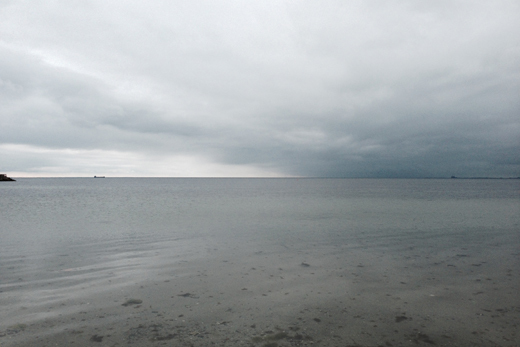 "It was very special to talk about Foucault in this beautiful land of sea and sky, the same country where Foucault wrote my favorite of all his books, ‘History of Madness,’ in the late 1950s," says Huffer. Her book "Mad for Foucault" is about "History of Madness." Jeffrey Lesser, Samuel Candler Dobbs Professor and chair of the History Department, spent June and July conducting research and lecturing in Brazil. He lead a number of historical walking tours of São Paulo as part of a municipal project aimed at getting residents to visit new neighborhoods. He also continued his research on areas of São Paulo that are divided between migrants from the northeast of Brazil and the descendants of Jewish, Arab, Japanese, Korean and Italian immigrants. With the World Cup taking place during his research, Lesser found himself living in an area occupied by the Brazilian Army, sent to guarantee the security of the USA soccer team in a hotel across the street from his apartment. Taking Lesser’s photograph there, the Army unit commander ordered the soldiers to "make an Army face!" Peter Little, chair of the Department of Anthropology, went to Ethiopia this summer to give a keynote address at the 2020 Conference on Building Resilience for Food and Nutrition Security, held in Addis Ababa. The conference had more than 800 participants from around the world. "I was excited to be on a plenary session with Ethiopia’s two-time Olympic gold medal winner, Haile Gebreselassie. His personal experience of not just getting through a life of poverty, but becoming a holder of 23 world records and two gold medals in the Olympics, is a powerful story of resilience," Little says. Little was also in southern Ethiopia, where he has been working intermittently for almost 15 years, to conduct field research with his colleague Uriel Kitron, Goodrich C. White Professor of Environmental Studies and chair of the Department of Environmental Sciences. "I continue to be amazed at how connected the world has become…sitting with a laptop in a small town and sending emails to the U.S. is something that did not seem possible when I first visited southern Ethiopia in 2001," Little says. Judy Raggi Moore, director of the Italian Studies program, conducted the 28th consecutive summer studies program throughout all of Italy with the theme, "Communicating through the Arts: Lessons for Medicine and Public Health." The program is an interdisciplinary academic immersion that engages faculty, graduate and undergraduate students, and visiting guests from the humanities, health care, law and business. "Students successfully learned to understand the evidence provided by interdisciplinary studies, and focus on how different forms of human expression intersect and create narratives of human existence," says Raggi Moore. "One of my students’ final essays says it best: ‘At the junction of history, art, literature and medicine, I’m inspired by the relevance of all disciplines in my quest for self-cultivation. I am motivated to carry forth my new sense of curiosity, fearlessness, and duty in all my future endeavors.’"
Michael Leo Owens, associate professor of political science, and his wife, Karen, traveled to Addis Ababa, Ethiopia, in June. Their purpose was to end a seven-year journey to adopt a child. They achieved it, returning to America with one of its newest citizens. "We never expected when we began our journey that Ethiopia would be our final destination. But domestic adoption for us proved more difficult and disappointing than we ever imagined it could be. We’re overjoyed that Ethiopia blessed us with our boy," Owens says. Their son, Tadesse (Tah-des-say), is five years old. His Amharic name is appropriate, translating as one who has been rejuvenated, restored or given new life. The Owens family thanks Emory for its new adoption reimbursement plan, which financially assisted them in covering their airfare to and from Ethiopia with their little boy. Sita Ranchod-Nilsson, director of Emory’s Institute for Developing Nations (IDN), traveled to the West Bank to meet with scholars and non-governmental organizations (NGOs) working on gender, development and conflict transformation. IDN’s experience fostering collaboration between scholars and NGOs was of interest to colleagues working on gender issues and social justice in the region. "Scarce resources and the security environment are contributing to an increase in gender-based violence," she says. Ranchod-Nilsson also met with community development organizations and the director of The Carter Center’s Israel-Palestine office. Pamela Scully, professor in the departments of Women's, Gender, and Sexuality Studies and African Studies, and director of Emory’s Center for Faculty Development and Excellence, went to Italy in mid June, with the Emory Italian Studies Program, as part of their symposium. The symposium, within the Italian Studies Program led by Judy Raggi Moore, is a weeklong exploration of themes covered in the course by students, the Italian Studies faculty, and visiting faculty and other professionals. "We discussed themes such as liminality (in-betweenness); exile, the difference between northern and southern Italy, and the long legacies of the Greek and Roman empires in art and architecture," says Scully. The group stayed in Matera, a world heritage site city built into caves, where they learned about social engineering programs and visited Ginestra, a tiny village "literally not on the map," notes Scully, learning about indigenous plants and their healing properties, with Emory professor and medical ethnobotanist Cassandra Quave. "We ended our symposium in Paestum, a small seaside village with the most spectacular Greek temples," says Scully, "where we learned about temple design, the colonization of this area, and visited an organic buffalo/mozzarella farm — an unexpected highlight of the trip!"